How I solved my problem finally with AVIC CARROZZERIA MRZ09. I remembered to have saved two backups for USER folder in my laptop. 1) Version before using DZOs auto Japanese-English setup which worked flawlessly in my AVIC MRZ09. 2) Version after successful conversion to English following DZOs programme. 1) I entered in TestMode using buttons and navigated up to USER DIR, then selected all files therein and hit delete. It took time but got it done. 2) Copied the English version of backup folder into the flash disc and transferred the contents in the USER folder of the AVIC MRZ09.. It took quite a bit of time to paste. Finally it got done. 3) Removed flash disc and switched off ACC. Waited for the unit internal fan to stop completely and switched back to ACC. 4) The unit got back alive without black screen and works fine. I hope this solution may help someone with similar problem like mine. To begin thanks a lot, you're helping quite a lot of people out there. I was able to change language from JP to Eng, and I'm happy with the files you provided. I know it's a quite old thread, but I was wondering about getting custom background images for my avic-mrz02. I followed the instructions and everything was ok apart from the "./extractbmp" which throws an error : "Segmentation fault: 11". edit the bitmaps in "updated". They must be 16 bit windows 3.x format, gimp can save this format but not many other image editors can. This should produce Image1.img, rename it and copy it to the unit. any solution to translate mrz099? Your contribution is appreciated always. 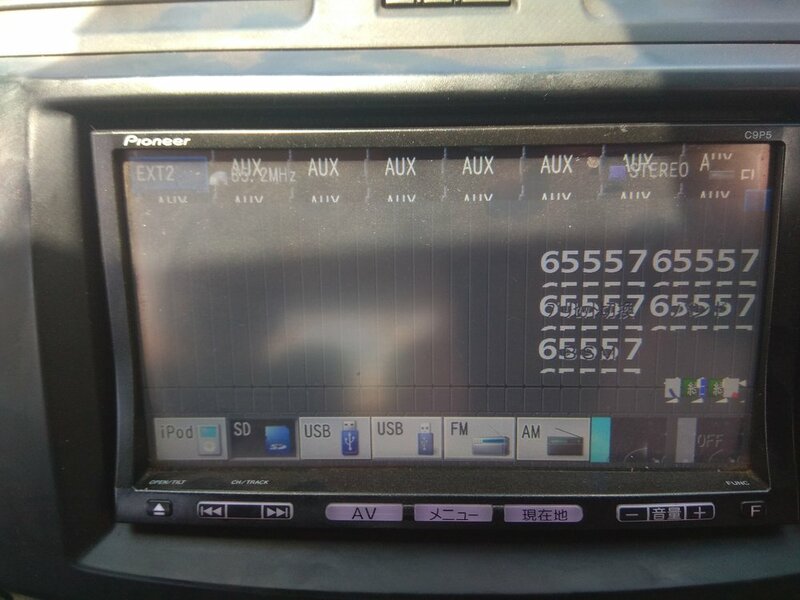 I jump boosted a battery to start my car The AVIC MRZ09 shows the characters in Japanese shown below, translated ''there is no program'' with number 7 at the bottom right of screen. The USER/DIŔ shows no content Any help to revive this unit? I have original USER content backup and the English one from your previous posts. . I tried copying and pasting the backups to the USER folder but nothing happens or shows up. The Unit copies and pastes to any other media like FLASH DISC OR SD but does not paste in USER folder.. Any help to revive it.? Thanks. I got it fix by deleting all user data and clearing the ram. I was an option in the test mode. How did you clean the RAM in your unit? How did you get back user data? Here's the NA090JPMZD.LNG translated, this should be the correct one for a Mazda. If not, try replacing the others. Thank you DZO, will try it out and give feedback. Any idea how to use new iphones with Mrz-99 ? My iphone X doesn't work with the IPOD function. It only charges. does not start, writes : Not program. When viewed through the file manager in the directory "USER" no files !! I have the same unit , MRZ09 having the same problem. The USER directory is blank. How did you solve your problem for this unit? Or else, Is there any one else who has solved this problem anyway anyhow? I need everyone's help here and thank you in advance. Hello everyone, I have AVIC-MRZ07, seems to have the files encoded in similar way. I tried downloading and compiling the C programs from GitHub and decoding/recoding my files, without luck. Im sharing my files attached, if someone can translate them or explain to me how to do it by myself. Compiling the C programs and running them with the LNG files I have gave weird characters and spaces when I exported to .TXT. Attached are JPE/ENG files for PF090 and PF110 from PRG0 as they appear on the unit. Thanks for the great work and all the time dedicated to make peoples life easier.